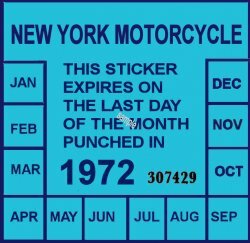 1972 New York Inspection sticker MOTORCYCLE - $20.00 : Bob Hoyts Classic Inspection Stickers, Add a Final Touch to your Restoration! This beautiful 1972 NY Motorcycle INSPECTION sticker has been painstkingly reproduced from an original. It has a "Peel and stick adhesive on the back to attach to your cycle bracket, or body, just like the original. For an additional $5.00 you can order this sticker with the adhesive on the front for your windshield to protect it from the weather.